In the social networking and communication world, google | facebook | twitter impacting our lives daily. May be many of us having different accounts from same service provider for different things to filter out from each other. We may use Microsoft Outlook or any other mail client to configure our all email at one place but for managing different social networking accounts like fb and twitter we may need a special service provider like hootsuite or opening different accounts in different browsers or may be any other. But if you still want something easy and with non-complexity then these Chrome extensions are best for you. 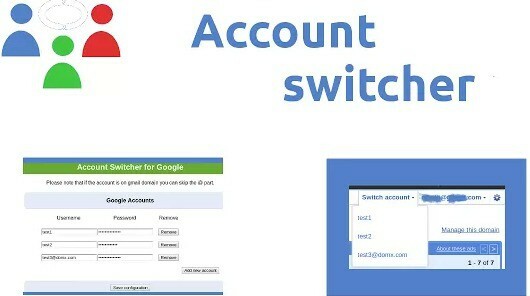 As per name, this is Quick Facebook account switcher with notifier where you may setup upto 10 different accounts. When you login with different accounts of facebook, you will get notifications from all the accounts simultaneously with options of choosing Sync Frequency and Notification sounds. It have ability to run in background i.e, even if you closed chrome it will be running! if we talk about passwords security than the answer is that, your passwords are stored locally with encryption and accessible to extension only. Like above facebook account switcher, this is next social networking accounts switcher available for Twitter. 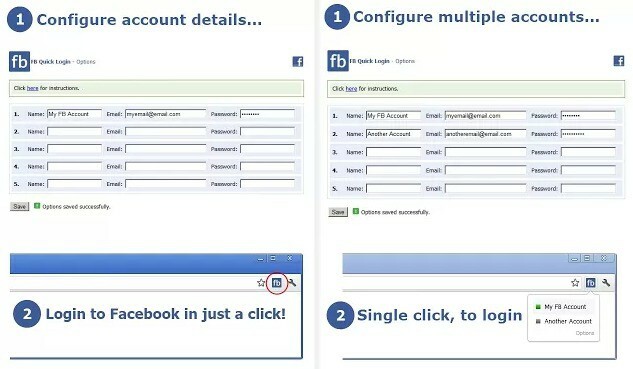 The process is same as above as you have configured in facebook account switcher. You have to do one time setup for setting up all your twitter accounts and your passwords will be saved with encryption on your local storage which is accessible to extension only! 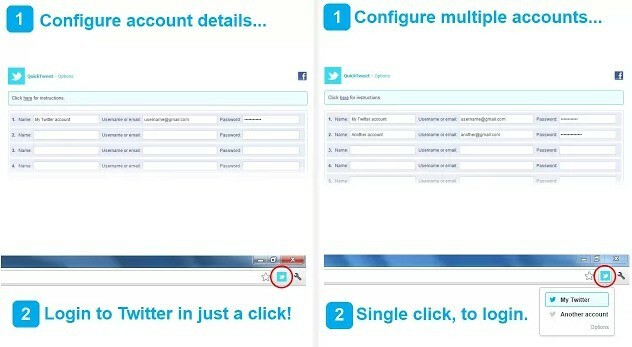 QuickTweet Login Assistant will pop up the configured accounts so that you can log in with just a click. Most of the people using Google’s gmail service because of wide variety of services they are giving over a single email address including normal email, Gdrive and other google services. May be you are having different gmail accounts for different works or filtered emails but when you want to configure them both in single browser, you will need this plugin for sure. The extension is just storing on your browser the list of emails for you and then with a simple drop down you can switch between them. We will say that these extensions are small in size and portable too in which you may have options to switch over different accounts with few clicks rather than opening them in different browsers. This plugins will ultimately save your time and you may have control on every other account you have.